Dichloropropanation is a type of cyclopropanation in which two atoms of hydrogen from methylene are replaced by chlorine atoms. 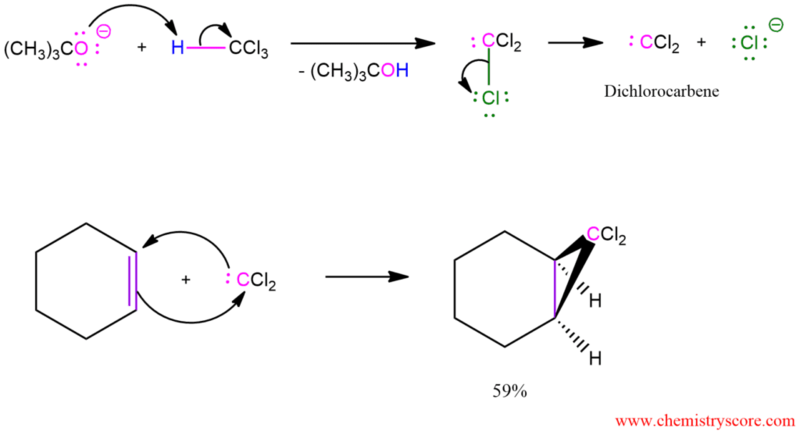 Cyclopropanation refers to any chemical process that generated cyclopropane rings. Free carbenes can be employed for cyclopropanation reaction, however, there is limited scope for this as few can be produced conveniently and nearly all are unstable. An exception is dihalocarbenes such as dichlorocarbene or difluorocarbene, which are reasonably stable and will react to form geminal dihalo-cyclopropanes. Cyclopropanes may also be synthesized from halogenated carbenes, which are prepared from halomethanes. For example, treatment of trichloromethane (chloroform) with a strong base causes an unusual elimination reaction in which both the proton and the leaving group are removed from the same carbon. The product is dichlorocarbene, which gives cyclopropanes when generated in the presence of alkenes.